First published in 1930, After Leaving Mr Mackenzie was Jean Rhys’ second novel. Set in Paris in the late 1920s, it features a woman in her thirties, Julia Martin. For the past six months, Julia has been surviving on an allowance of 300 francs per week which she receives from her ex-lover, Mr Mackenzie. Her eyes gave her away. By her eyes and the deep circles under them you saw that she was a dreamer, that she was vulnerable – too vulnerable ever to make a success of a career of chance. He had lied; he had made her promises which he never intended to keep; and so on, and so on. All part of the insanity, for which he was not responsible. Julia’s arrival at the restaurant heralds one of the pivotal scenes in the novel. It’s too intricate, too subtle to describe here, but it’s a great piece of writing. Julia refuses her ex-lover’s payoff and leaves with her dignity reasonably intact; Mackenzie hopes that no one has witnessed their exchange. Luckily for Julia, the encounter is noted by an Englishman named George Horsfield, who is sitting at the next table. When Julia leaves the restaurant, Horsfield follows. Julia has had a difficult life, and it shows – she appears tired and depressed. Horsfield befriends Julia, gives her 1,500 francs and advises her to return to London for a while. On her arrival in London, Julia takes a room at a shabby hotel in Bloomsbury. What follows is a series of bruising encounters as Julia re-establishes contact with her family, most notably her sister, Norah and her Uncle Griffiths. In direct contrast to Julia, Norah has done the ‘right thing’ by staying at home to care for their invalid mother. Norah and Uncle Griffiths clearly disapprove of Julia’s decision to go her own way in Paris. (Julia had been married but subsequently left her husband. Uncle Griffiths is of the opinion that she ought to have extracted some kind of financial settlement from this man). Griffiths dismisses Julia with a one-pound note – he simply doesn’t care and wants little more to do with her. This is my second reading of Mr Mackenzie. It’s quite a difficult novel to describe, but I wanted to try to write about it before going on to read more of Rhys’ work. The writing is superb, the characters are complex and nuanced. Rhys appears to have mined her own past, her own experiences of the harsh reality of life as a lone woman in the city. Julia seems trapped; she is weary of life and drinks as a means of blunting the pain of her situation. Her life reads like a series of fragmented episodes, and there is little hope of a bright outlook. Rhys exposes the hypocrisy and cruelty of society at the time: no one seems to care about Julia; she is shunned by her family and acquaintances. Her predicament reminded me a little of the final stages of Lily Bart’s situation in The House of Mirth, another bruising and unforgettable story. I have another couple of novels by Rhys: Voyage in the Dark and Good Morning, Midnight. I’d also like to read her first novel, Quartet. After Leaving Mr Mackenzie is published in the UK by Penguin Modern Classics. Source: personal copy. Book 18/20 in my #TBR20. This entry was posted in Book Reviews, Jean Rhys Reading Week, Rhys Jean and tagged #ReadWomen, #ReviewWomen2015, #TBR20, Book Review, Fiction, Jean Rhys, Penguin Modern Classics, UK on April 29, 2015 by JacquiWine. So pleased you reviewed this! One of my favourite books – and I don’t say that lightly. It means it’s one of the books I’ve carried with me across all of my country and house moves, together with ‘Sleep It Off Lady’. Jean Rhys is so sublte, nuanced, poignant… and not that well known nowadays, except for ‘Wide Sargasso Sea’. Thank you. I’m not surprised to hear this is one of your favourite books…I just knew you would be Jean Rhys fan! It’s funny how Wide Sargasso Sea tends to get so much more attention than her other work. I want to read it, but I’m glad I started with one of her earlier novels. Have her Completed Stories but really like the sound of this too! Thanks, Poppy. Yes, you’re right – WSS must have benefited from the Jane Eyre connection. Just looked at Pizzichini’s The Blue Hour. I’m not usually a fan of biographies, but this one looks fascinating. One for the wishlist as I’ve started another round of #TBR20 which means no purchases for the next three months or so! As a writer, Rhys must have poured so much of the spirit of her own life into her work. The phrase ‘the better she got, the less she was read’ is quite ppoignant, eh? Very welcome. Yes, terribly poignant. The article is spot on, isn’t it? The emotional precision; women imprisoned in their isolation; lives falling slipping down a steep slide. It’s all there. Oh, I shuddered when I saw your book this week- such terrifying bleakness. I really don’t think I could read it a second time. How good she is on the special humiliation of the woman dependent on the passing fancies of men for whom such women mean so little (like Blanche Dubois, always depending on the kindness of strangers). “Wide Sargasso Sea” is far and away my favourite. It is terrifying and Julia’s situation is so desperate…I think that’s why I found it so difficult to write about this book. That’s such a good point about her dependency of the whims of men: acquaintances, lovers and family members (all of whom let her down at various points). I hadn’t thought of the link with Blanche Dubois, but that’s a great connection. I’m really glad to hear of your love of Wide Sargasso Sea; it’s on the wishlist! I am definitely going to read some JR this year . I have read Wide Sargasso Sea but I am reliably informed that others are even better . Loved the sound of this from your review. Oh yes, do read some Rhys, Helen. I’m glad you like the sound of Mr Mackenzie…it is bleak though, not one to read if you’re feeling a bit low. I’ve heard some great things about her early work too – several other bloggers and readers seem to rate them. Great review Jacqui. There are some books whose impact is difficult to describe. The House of Mirth comparison helped build the picture for me. Tales of people falling into desperate straits can be so compelling. That last quote is so powerful and depressing. Thanks, Brian. I’m glad the House of Mirth comparison was useful. I can’t recall if you’ve read the Wharton (I think you have), but Julia’s situation definitely reminded me of Lily Bart’s, certainly in the closing stages. It’s a devastating quote, isn’t it? What a simply brilliant review – I really want to read this one now, I love the premise and you can’t beat a book populated by complex characters and backed up with great writing. Jean Rhys does what she does so very well, and now you have me contemplating a little re-reading. Hurray! It’s nice to revisit old friends…enjoy. I went through a Jean Rhys phase many moons ago, and I’ve often thought about revisiting her. I’m not sure I read this one, though – and I think I would like to now, very much! Oh, wonderful! I’d love to hear your thoughts on it, Karen. I need to read the others but this one certainly stood up to rereading (and I wanted to revisit it before moving on). You never know – I might get to it soon. Or maybe a re-read of Wide Sargasso sea – we shall see! This sounds fascinating! As I was reading your review I kept thinking that it sounded like The House of Mirth too. The only Rhys I have in the 746 is Wide Sargasso Sea. It’s funny, isn’t it? The Lily Bart connection comes through quite strongly here: the bleakness of Julia’s situation: the way she is treated and shunned by those around her; her ultimate reliance on men. I think you’d like this novel very much, Cathy. You have Wide Sargasso Sea, though, and I’d love to hear your thoughts on it! It’s great that so many people seem to be reading Jean Rhys at the moment, I went through a phase of reading EVERYTHING she’d written about 30 years ago. I always felt that I liked Wide Sargasso Sea less than her others, I wonder if I’d feel the same now. Time to revisit some of her books I think. Isn’t it? Another great writer enjoying a bit of revival. Oh yes, do revisit them, Claire, especially if it’s been a while since you first read her work. It would be fascinating to see how you find them now. Your review reminds me once again that I really should get around to reading one of her books. I’m sure they are all good – do you have a favourite? Mr Mackenzie is the only Rhys I’ve read so far, but you’re right, her books have a great reputation. Some of the other commenters might be able to help with this, but I suspect that either Mr Mackenzie or Quartet would be a good introduction to her earlier work. Alternatively, you could go for her best-known novel, Wide Sargasso Sea, which tells the story of Mr Rochester’s wife from Jane Eyre. I’d like to read them all! Timing is so important, isn’t it? I’ve a feeling that Mr Mackenzie might be an easier entry point than Good Morning, Midnight when it comes to Jean Rhys, but that’s just my feeling based on what I know of GMM. Oh yes, do leave a gap between Academy Street and Rhys; too much sadness and hopelessness would be a heavy burden to bear. Wait, you mean Wide Sargasso Sea isn’t Rhys’ “depressed style”? That doesn’t exactly make me want to run out to read her other books. I’m kidding – a bit. I actually did read some other Rhys, but I found her works difficult to take in succession and have had little desire to revisit them. Perhaps I should revisit that response. I went on Rhys bender some years ago. I don’t recommend reading too many of hers in a row even though that’s what I did (with a few breaks in between). Any favourites, Guy? Would you suggest I read Quartet before moving on to Voyage in the Dark or Good Morning, Midnight (both of which I already own)? Let me know if you’ve reviewed any – I couldn’t see any posts at yours, so I guess you must have read them before the blog kicked off. Rhys is a marvel, one of my favourite writers. I’ve reviewed two of hers at mine, but not this one. It is though as you’ve seen in my #tbr20 and seeing this I’m really glad it is or I’d already be considering abandoning the #tbr20 thing so I could fit this in. “After seeing him two or three times she had spent the night with him at a tawdry hotel. Perhaps that was the reason why, when he came to think of it, he had never really liked her.” Ouch. Rhys really is a marvel. You’ll love it, Max. It blew me away. I’m really looking forward to reading your review of this one whenever you get to it in your twenty (a fine inclusion, you’ve chosen well). That quote is very telling, isn’t it? So devastatingly precise and brutal, so incisive too. I’ll check out your reviews – I know I’ve seen your Good Morning, Midnight piece, but possibly not the other one (Quartet?). Interesting how Wide Sargasso Sea has come to represent Rhys for many readers (myself included): some writers seem prone to this. I like the idea of the shift in narration – it sounds like another book I should get round to reading! She’s one of a few authors I’ve read everything of. She’s a marvel, as Max says. I read them one after the other and so they are a bit blurred. Wide Sragasso Sea stands out, as it’s different. I loved her short stories as well. It saddens me to think it’s inspired by her own life. You knew that? That biography would interest me. She’s written an unfinished memoir. Well, I guess I had a feeling you’d like her work. The unfinished memoir sounds interesting too; I’d like to know more about Rhys’s life (perhaps once I’ve read one or two of her other novels). I only know Rhys from her acclaimed novel,”Wide Sargasso Sea” (which I must confess I haven’t read), so I’m not familiar with this novel that you have so excellently reviewed. From your detailed description of the characters, as well as Rhys’s flawless prose, it’s evident that there’s a lot of psychological depth in “After Leaving Mr. McKenzie”. I need to put this book on my Goodreads TBR shelves! You’re very welcome – thanks for dropping by, Maria! Yes, Rhys manages to pack a quite a lot of psychological acuity into this short novel. We see different sides to several of the main characters so they never feel ‘black-and-white’ so to speak. I hope you like this one should you get the opportunity to read it. Oh, I’m sure I will! However, I think I’ll start with “Wide Sargasso Sea”, just because I’d like to get Rhys’s take on “the madwoman in the attic”. Also, “Jane Eyre” happens to be my favorite classic. I don’t think any of the film versions of it have done justice to Jane. So perhaps Bronte herself didn’t do justice to Rocherster’s first bride, either. Good idea, especially if Jane Eyre is your favourite classic! I enjoyed the Mia Wasikowska/Michael Fassbender film, but I watched it again recently, and there’s something missing from Wasikowska’s performance. She’s just not feisty enough for the Jane I’d envisaged from reading the novel! I don’t know if you’ve ever seen the 2006 BBC adaptation with Ruth Wilson and Toby Stephens, but I thought it was very good. Wilson and Stephens Make an excellent Jane and Rochester. Excellent review, Jacqui. Rhys has been on my mental TBR since Max’s reviews. I have read Wide Sargasso Sea, knowing that it’s different from her others. It didn’t leave lasting memories although I recall I liked it well enough. Thanks, Emma. Yes, Max is a big fan of Rhys. Max will be reading Mr Mackenzie at some point in the next few months (it’s in his #TBR20), and I’m sure he’ll do a great job of reviewing it. (I struggled to find the right words for this one, to be honest – it’s pretty devastating stuff). Haha, you could be right there. I think you might find Julia a bit frustrating, but I would love to hear your thoughts on how her situation and choices compare to a woman’s life in 19th-century Paris. See how you feel once you’ve read Max’s review, or maybe you could read along with him? Wide Sargasso Sea seems to divide people; some readers love it citing it as one of the great novels of the 20th century, but others seem to prefer Rhys’s earlier work. It’s interesting that it didn’t leave much of a lasting impression on you. I’d like to read it at some point, but Voyage in the Dark and Good Morning, Midnight ought to take precedence as I already own those two. It’s just that, as I was reading your review I was thinking it would have been more productive to try to work than to chase one ex-lover after the other for money and expect them to be willing to support her. My mind must be too far away from the mind of a woman of that time. I’d like to start with Quartet or Good Morning Midnight. Back to Rhys, Quartet might be a good one to start with as it was her first novel. I kind of wish I’d started there myself! I’m fascinated by Jean Rhys but – shameful confession – I haven’t even read Wide Sargasso Sea, though I’ve owned a copy of it for years and years. I don’t know why I’m so reticent. It must be because I feel I know more about her than is comfortable, and that like Patricia Highsmith, I might end up admiring her books a great deal without loving them. But really, none of that is any excuse. She is an author I really must read. Oh yes, do read her! As you’ll have gathered, I’m late to Rhys myself (and I don’t even own Wide Sargasso Sea – not yet, anyway) but I thought Mr Mackenzie was excellent. I really loved the writing, and the story held me close. It pains me to think of her life; she must have poured so much of the spirit of her existence into her work. I used to teach WSS to A Level students and it was starting to feel like I’d read it too many times (if it’s possible to OD on Jean Rhys). I recently re-read Good Morning Midnight though and loved it so much. 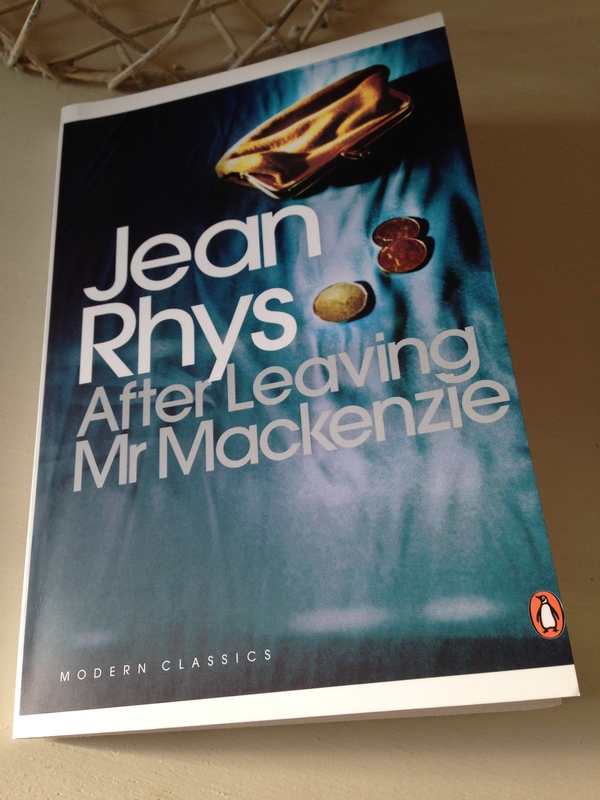 After reading your review it looks like After Leaving Mr Mackenzie is going to have to be my next Rhys read – it’s also a reminder that she does come up with the most wonderful titles for her novels. I’m glad looking back at this you found it a difficult novel to describe too. I found writing my own review of this one surprisingly tricky, much more so than I’d expected. It’s excellent, but it’s subtle in its excellence. Yes, it’s a tricky novel to capture, but you’ve made a fine job of it in your review. I really wanted to say something more about the restaurant scene, but the words just wouldn’t come at the time. It’s such a subtle scene, in terms of both the dialogue and the gestures that pass between Julia and Mr M.
I’d missed that. It’s weird. I follow your blog. I get email updates. And yet still you have this knack for pulling out incredibly interesting archive reviews. I’ll take a closer look. Haha! WordPress email notifications can be a bit flaky at times. Sometimes they just stop working for a couple of weeks. It’s happened to me before. I think you’d like the Madeleine Bourdouxhe. There’s also a touch of Simenon about it. I’ve just posted on one of his romans durs, The Widow, and there are some similarities between the two novellas. It didn’t occur to me at the time, but the more I think about it the more I can see a connection.